If you are coming from Tampa, we are just a half an hour away. Take I-275 south towards St Petersburg. Take exit #19 towards 22nd Ave.S (Gulfport). Bare right on 22nd Ave S. Go 1.3 miles. Turn left on 49th St S. Go 0.2 miles Turn right on 26th Ave S. Go 0.1 mile. 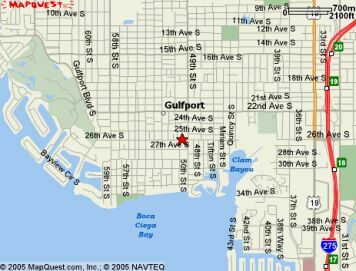 Arrive at 4950 26th Ave S, Gulfport on the left.